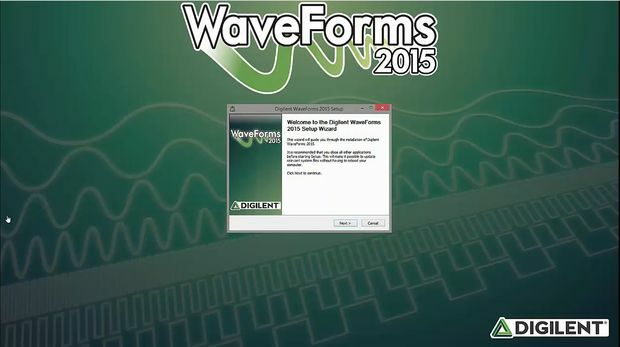 WaveForms is software developed by Digilent and intended for use with the Analog Discovery 2, Analog Discovery Legacy, the Electronics Explorer Board, and the Analog Discovery 2 NI Edition. 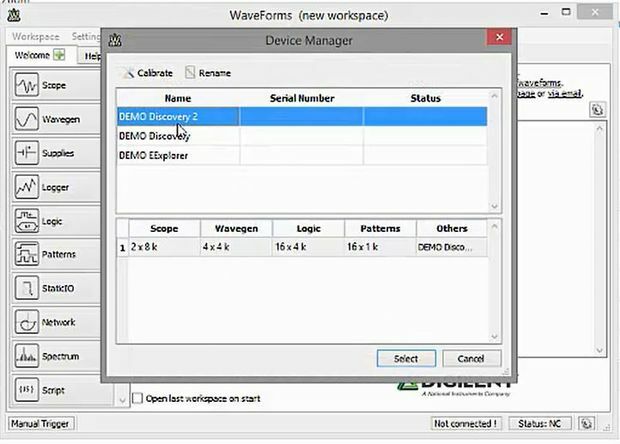 WaveForms provides a user interface for a 2-channel oscilloscope, logic analyzer, arbitrary waveform generator, digital I/O, and more. It's free to download and compatible with Mac (Apple), Windows, and Linux. 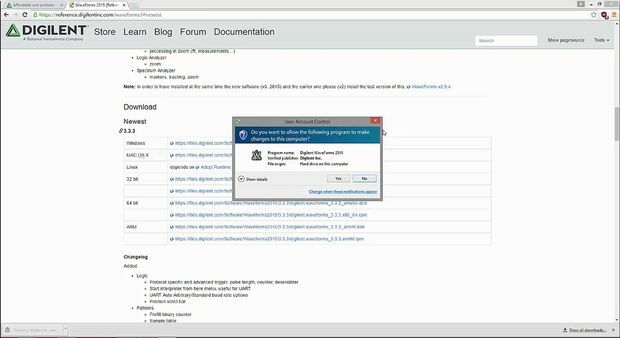 This tutorial will guide you through the steps involved in the installation process on Windows after downloading it from the website. Open the WaveForms executable file that you downloaded in the unboxing tutorial. 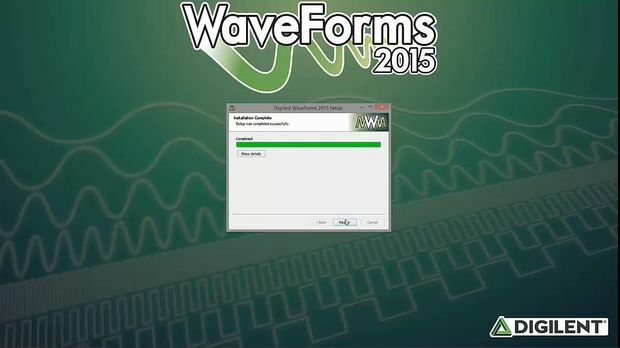 If you have not downloaded WaveForms yet, you can find it here. If you are prompted to allow WaveForms to make changes to your computer, click Yes. If not, continnue to the next step. Read through the license agreement and terms and conditions and click I Agree to proceed. Choose the installations you would like. You can install the Adept Runtime, WaveForms Runtime, WaveForms Applicaion, and WaveForms SDK. Adept Runtime allows WaveForms to communicate with the Analog Discovery 2, Analog Discovery, ELectronics Explorer Board, and Analog Discovery 2 NI Edition. WaveForms Runtime contains a library and device support files needed to run custom applications. 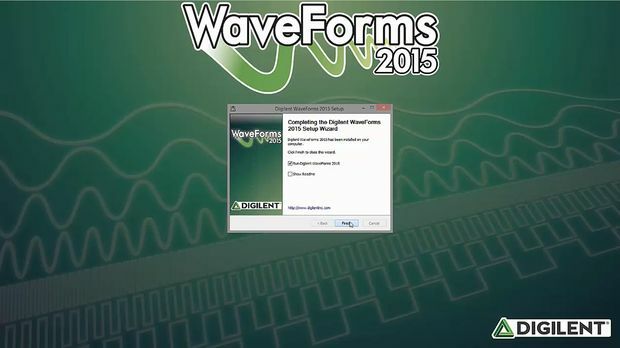 WaveForms Application is the Digilent virtual instrumentation interface. WaveForms SDK is the software development kit for creating custom applications. Next, choose the user you want to install WaveForms for, and check the box if you want a shortcut created. You'll need to choose an installation destination or keep it as the default. WaveForms will be installed as indicated by the progress bar. Uncheck or check the boxes to open WaveForms and the readme. 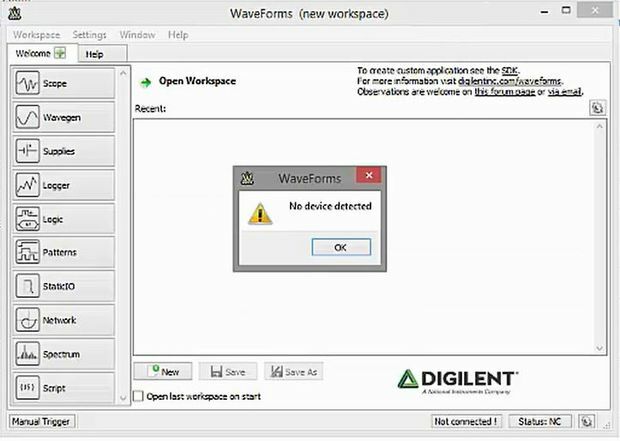 When WaveForms initially opens, if you have no device plugged in it will give you a warning that no device was detected. That's okay, because WaveForms offers a demo mode where you can try out the features without having a compatible device. 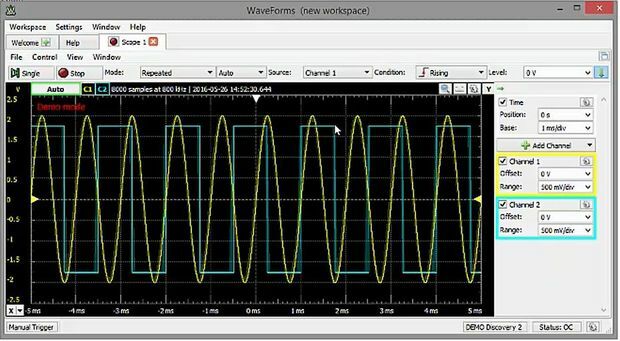 For example, here is a demonstration of the oscilloscope scoping a square amd sine wave. 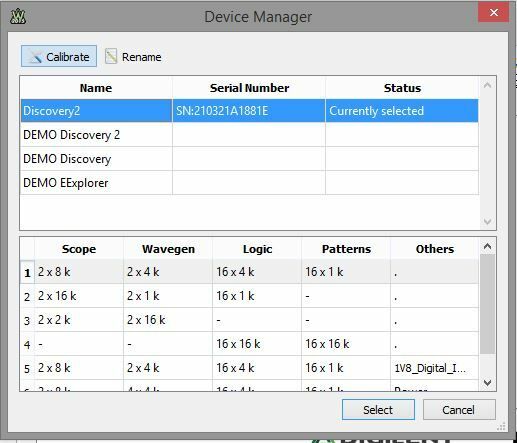 When you plug in your Analog Discovery 2 it will appear on the device manager and you can then select it to connect to it. Now that you have WaveForms you can move onto calibrating your device.